The Jesusita Fire occurred on May 5, 2009 in the Santa Ynez Mountains above Santa Barbara. This wildfire destroyed 80 homes and damaged 15 more. This project is a replacement residence for one destroyed in this wildfire. As desired by the owners, the new structure was to be as fire-resistant as any concrete structure. The SCIP panel technology was chosen for its fireproof nature, its natural resistance to insects, pests, and rodents, and its energy efficiency. Therml-Impac™ Panels as manufactured my Impac International was selected as the SCIP panel product. Johnson Leifield Structural Engineers bypassed the product’s ICC-ES Legacy Report (ER-3509) since it was approved under a prior Building Code, and designed the structure from scratch as a poured-in-place concrete structure. 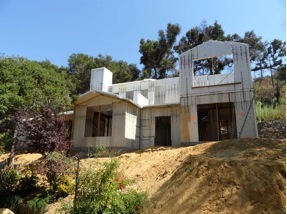 The Santa Barbara Building Department quickly approved this design as being in conformance with the then current 2007 California Building Code.